Organic soya milk, containing calcium; a delicious alternative to milk. From start to finish this soya-calcium drink is packed with goodness. Not only does it taste great, but it contains high-quality protein, and algae that contains calcium. It’s gently sweetened with apple concentrate. Provamel is the organic brand of Alpro, the European pioneer and market leader of plant-based food and drink products. Provamel aims to make plant-based eating easier through its delicious range of drinks, created using ingredients such as soya, hazelnut and almond. The company promotes an organic lifestyle and wholesome living that has a positive impact on people and the environment. All its products are suitable for vegans and those who are lactose intolerant. They are also free of artificial flavourings, colours and preservatives. Provamel ingredients are ethically sourced, respect the environment and stimulate bio-diversity. Plant-based eating reduces the likelihood of heart problems and type 2 diabetes. 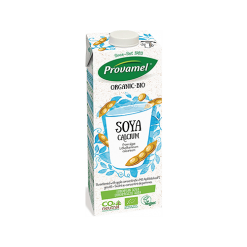 Provamel drink varieties include soya (a nutrient-rich dairy alternative and the richest plant source of protein), rice, rice-coconut, almond (high in calcium and vitamin E), and oats. There are also two delicious soya desserts: vanilla and chocolate. Ingredients: Organic hulled soya beans, organic raw cane sugar, organic fat reduced cocoa, organic chocolate, sea salt, thickener (locust bean gum), Bourbon vanilla extract.